It’s the season for fuzzy sweaters and heavy coats, as well as colds and flu. But what does cold weather have to do with catching a cold? For generations, mothers worldwide have advised bundling up to avoid getting sick. Yet medical experts call the association an old wives’ tale. Despite the prevalence of coughs and runny noses during the cold months of the year, scientists assert that a drop in temperature is not responsible for the rise in respiratory infections. It is viruses that cause illness, they contend. Cold is just a coincidence. One explanation for the higher number of colds during fall and winter is that we spend more time indoors. People are packed inside with the windows closed. As the same old air circulates in a well-populated room, we get more exposure to pathogens, and thus more illness. 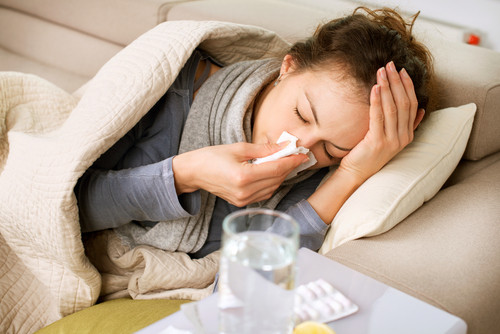 However, recent discoveries suggest cold plays more of a role in making us sick than previously thought. One example researchers have noted is that rhinoviruses—the most common cause of colds—reproduce more effectively in cooler temperatures. Cold weather is just the straw that breaks the camel’s back in terms of having more stress and decreasing your immunity. No study has been able to prove that exposure to cold increases the likelihood of illness. Yet for doctors who look beyond the virus explanation, evidence shows that cold may play a pivotal role. According to Dr. Renee Miranda, a physician at the Center for Integrative Medicine at Ohio State University, cold weakens our defenses. “Cold weather is just the straw that breaks the camel’s back in terms of having more stress and decreasing your immunity,” she said. Our world is full of microbes with the potential to cause infection, yet few lead to illness, thanks to our immune system. When we are overworked, dehydrated, sleep deprived, and eating predominantly junk food, we deplete the resources our body needs for immunity, Miranda says. When the season changes and a new stress is added to the mix in the form of cold, it can tip the scales, making it more likely that an infection will take hold. Before the discovery of microbes, ancient doctors looked to other, more nuanced causes of illness, such as lifestyle and environmental imbalances. In traditional Chinese medicine—a system of diagnosis and treatment based on observations from nature—cold is a force that we must protect our bodies against or else risk developing health problems. The dispute about whether cold causes colds stems from scientific debates in 19th-century France, LaGreca notes. For Louis Pasteur, who promoted the idea of germ theory in modern medicine, the virus was primary. However, Pasteur’s contemporary, Claude Bernard, argued that infections hinge not on microbes, but on environmental conditions that allow microbial invaders to flourish. In the 20th century, scientists overwhelmingly supported Pasteur’s position. They focused on the pathogen as the root of illness and relied exclusively on microbe-destroying medicines—like antibiotics—for treatment. However, emerging research on the microbiome and our evolving understanding of how the immune system works gives increasingly more credit to Bernard’s view that environmental conditions profoundly impact illness. It’s the same view that ancient Chinese medicine has held for centuries. “The terrain is tremendously important, and that’s exactly how the Chinese thought about it,” LaGreca said. If you’ve spent any time in sub-zero wind chill, with your cheeks and fingers stinging with pain, it’s clear that cold is a formidable force. Cold is stress, and Chinese doctors take it very seriously. They even discourage drinking cold beverages, because our body must expend extra energy warming these liquids to our internal temperature. To deal with the added stress of winter, ancient Chinese texts give lifestyle instructions about how to live healthfully during the season. When nature is cold, dark, and still, we are also encouraged to become more aligned with this yin energy. That means getting more rest and cultivating a gentler, more contemplative spirit. When nature is cold, dark, and still, we are also encouraged to become more aligned with this yin energy. However, such stress-minimizing advice can be hard to follow in our yang-dominant modern society, which demands we keep a fast pace all year long. “We shouldn’t be keeping the same schedule, but that’s the world we live in,” LaGreca said. These winter lifestyle recommendations are intended to preserve and strengthen something Chinese medicine calls wei qi, or defensive energy. Think of wei qi as a protective layer of energy that covers your entire body. It is often compared with the modern notion of the immune system. Strong wei qi prevents the damaging effects of cold from invading the body, while weak wei qi leaves us susceptible to illness. Chinese medicine practitioner Dr. Andrew Miles says that if we refuse to slow down during the winter, our withering wei qi will eventually force us to obey. In a recent broadcast of Botanical Biohacking, a podcast dedicated to Chinese medicine, Miles refers to a 2016 study that found that when our immunity is compromised, our social behavior becomes more introverted. One way to support wei qi function is by wearing warm clothes. Consider wei qi to be your base layer, while your sweater, scarf, and anything else you pile on help provide added insulation. The Chinese believe it’s especially important to keep the neck and abdomen covered because these areas are particularly vulnerable to the cold. However, even the best coat can’t replace good wei qi. You can replenish your wei qi with rest and hot, nourishing meals. Miles recommends pungent and bitter foods (like garlic and shiitake mushrooms) to help strengthen wei qi. For those who need extra wei qi support, the Chinese recommend herbal remedies or other traditional treatments. Moxibustion, for example, is a treatment that originates from the notoriously frigid regions of northern China. It involves burning bits of fragrant herbs over acupuncture points on or near the body, and it has been shown to increase the production of white blood cells—a sign that the immune system is kicking into action. It sounds contradictory, but exposure to cold can also strengthen our ability to tolerate cold. Think about how a 50-degree-Fahrenheit day is considered balmy in Alaska, but unbearable in New Orleans. The reason is hormesis, a biological principle in which body function improves with small doses of something that would otherwise harm it. For example, too much weight can injure a muscle, but repeatedly subjecting that muscle to a little resistance can make it stronger. The same holds true with cold. Too much weight can injure a muscle, but repeatedly subjecting that muscle to a little resistance can make it stronger. The same holds true with cold. Using the hormetic principle to your advantage requires having a feel for how much cold you can stand. Taking on more stress when you’re already run down is foolish. But if your wei qi feels robust, spend some time outside. This same sense of balance applies to physical activity. While winter is a time for rest, we can’t go totally lax. Miranda advises her patients to maintain a sustainable exercise routine. Another wintertime habit to stay diligent about is washing your hands. This doesn’t boost your immune system, but it will minimize your exposure to the viruses and bacteria that can cause illness. However, there’s no need to micromanage when it comes to protecting yourself. In Chinese medicine, paying attention to balance in all areas of life is the ultimate goal, and the main protector against illness. “Just be mindful of things,” Miranda said.